After long experience I am convinced that the best place to study nature is at one’s own home, – on the farm, in the mountains, on the plains, by the sea, – no matter where that may be. One has it all about him then. The seasons bring to his door the great revolving cycle of wild life, floral and faunal, and he need miss no part of the show. At home one should see and hear with more fondness and sympathy. Nature should touch him a little more closely there than anywhere else. He is better attuned to it than to strange scenes. The birds about his own door are his birds, the flowers in his own fields and wood are his, the rainbow springs its magic arch across his valley, even the everlasting stars to which one lifts his eye, night after night, and year after year, from his own doorstep, have something private and personal about them. The clouds and the sunsets one sees in strange lands move one the more they are like the clouds and sunsets one has become familiar with at home. The wild creatures about you become known to you as they cannot be known to a passer-by. The traveler sees little of Nature that is revealed to the home-stayer. You will find she has made her home where you have made yours, and intimacy with her there becomes easy. Familiarity with things about one should not dull the edge of curiosity or interest. The walk you take today through the fields and woods, or along the riverbank, is the walk you should take tomorrow, and next day, and next. What you miss once, you will hit upon next time. The happenings are at intervals and are irregular. The play of Nature has no fixed program. If she is not at home today, or is in a noncommittal mood, call tomorrow, or next week. It is only when the wild creatures are at home, where their nests or dens are made, that their characteristics come out. hurling defiance at vast death. They are as cheery and active as if on a summer holiday. The birds are sure to find the tidbit you put out for them on the tree in front of your window, because, sooner or later, at this season, they visit every tree. The picking is very poor and they work their territory over and over thoroughly. No tree in field or grove or orchard escapes them. The wonder is that in such a desert as the trees appear to be in winter, in both wood and field, these little adventurers can subsist at all. They reap a, to us, invisible harvest, but the rough dry bark of the trees is not such a barren waste as it seems. The amount of animal food in the shape of minute insects, eggs, and larvæ tucked away in cracks and crevices must be considerable, and, by dint of incessant peeping and prying into every seam and break in the bark, they get fuel enough to keep their delicate machinery going. 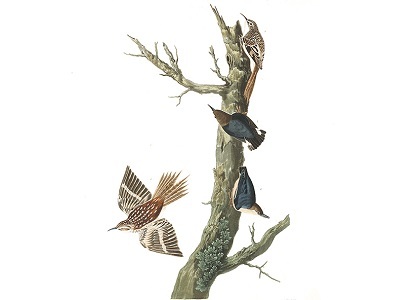 The brown creeper, with his long, slender, decurved bill, secures what the chickadee, with his short, straight bill, fails to get. The creeper works the trunk of the tree from the ground up in straight or in spiral lines, disappearing quickly round the trunk if he scents danger. He is more assimilatively colored than any of his winter congeners, being like a bit of animated bark itself in form and color, hence his range and movements are more limited and rigid than those of the woodpeckers and chickadees. The creeper is emphatically a tree-trunk bird. His enemies are shrikes and hawks, and the quickness with which he will dart around the trunk or flash away to another trunk shows what the struggle for life has taught his race. The range of the nuthatch is greater than that of the creeper, in that he takes in more of the branches of the tree. He is quite conspicuously colored in his suit of black, light gray, blue, and white, and his power of movement is correspondingly varied. His bill is straight and heavier, and has an upward slant with the angle of the face that must serve him some useful purpose. He navigates the tree trunks up and down and around, always keeping an eye on every source of danger in the air about him. I have never seen a nuthatch molested or threatened by any bird of prey, but his habitual attitude of watchfulness while exploring the tree trunks, with head bent back and beak pointing out at right angles, shows clearly what the experience of his race has taught him. Danger evidently lurks in that direction, and black and white and blue are revealing colors in the neutral woods. But, however much the nuthatch may be handicapped by its coloration, it far outstrips the creeper in range and numbers. Its varied diet of nuts and insects no doubt gives it a more vigorous constitution, and makes it more adaptive. It is the vehicle of more natural life and energy. How winter emphasizes the movements of wild life! The snow and the cold are the white paper upon which the print is revealed. A track of a mouse, a bird, a squirrel, or a fox shows us at a glance how the warm pulse of life defies the embargo of winter. From cracks and rents in the frigid zone which creep down upon us at this season there issue tiny jets of warm life which play about here and there as if in the heyday of summer. The woods snap and explode with the frost, the ground is choked with snow, no sign of food is there for bird or beast, and yet here are these tiny bundles of cheer and contentment in feathers – the chickadees, the nuthatches, and their fellows. Thank you. I find John Burroughs one of those massively interesting early writers on the environment.